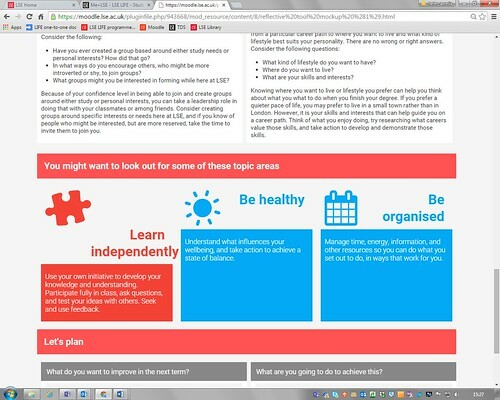 LSE LIFE’s Dr Helen Green explains how Me+LSE will support students and their advisers to identify students’ existing skills and plan future areas of development. One of the fundamental aims of LSE LIFE is to create a space where students take the lead in their own development, not simply as “good students”, but as independent thinkers: well informed, critical, analytically sophisticated and globally employable, as the Education Strategy puts it. So when we were thinking of ways to help students make sense of everything that’s on offer here at LSE and understand what they could do in LSE LIFE, we quickly resolved that a “diagnostic tool” would not be appropriate. Offering an assessment of what an individual student might need or want in order to do well at LSE would be contrary to the very notion of supporting students to set their own priorities and goals and make their own decisions about how to reach them. On one hand, we wanted students to become more aware of skills they already mastered, areas they wanted to improve, and experience they lacked. However, we were not willing to “prescribe” solutions. On the other hand, we also wanted to create a framework that academic advisers, teachers, and other colleagues might wish to use when they talk with students about their experience, aspirations, and what they could do to do well at LSE. Over the summer of 2017, we developed Me+LSE. 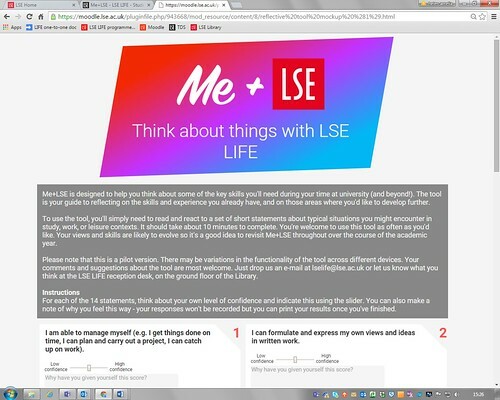 Me+LSE is LSE LIFE’s online reflective tool that helps students think about key skills they’ll need at university and beyond. It encourages independent and personal reflection on the experience and skills students already have, and those areas they may wish to develop further. To use the tool, students respond to a series of statements about typical situations they might encounter in study, work, or leisure contexts. They reflect on and write about their own confidence with respect to each statement, and consider their own priorities and goals. Once students respond to all 14 statements, they generate an information graphic of how they judged their confidence in diverse areas, and get some feedback on the kinds of skills relevant to each area. Some suggestions are offered, including events they can take part in at LSE LIFE and with other professional services divisions at the School. Skills for study and for everyday life are presented using simple definitions and illustrated with a set of icons. Students also encounter these same icons throughout the academic year, as we use them to signal skills that participants can practise in every LSE LIFE workshop. This way, students can identify for themselves the skills or goals that are important for them, and look out for events that focus on those specific areas. Students and staff have already used the tool almost 500 times in the first four weeks of term. Students are encouraged to use the tool as often as they like – to think about how their responses evolve over time – and to save their results, so they can discuss them with peers, their academic advisers, or with LSE LIFE study advisers. 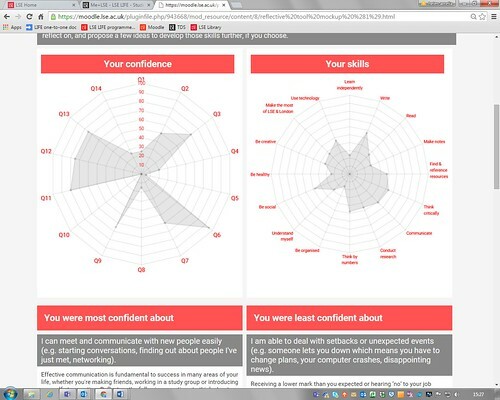 Academic advisers can use Me+LSE as a way to frame discussions about advisees’ experiences and what they can do themselves to develop skills to do well both inside and outside the classroom. The tool, together with the icons and definitions, can help clarify skills for study and for life and show how these skills are closely related and intertwined. If you’d like to try it out, or recommend it to your students, you’ll find Me+LSE on LSE LIFE’s Moodle page, via http://www.lse.ac.uk/intranet/students/LSE-LIFE/MePlusLSE.aspx. If you have any questions or comments about Me+LSE, get in touch with us at lselife@lse.ac.uk.